Week ending 26th October 2018. The aim of the Fed’s current monetary tightening cycle should be to cool down (not contract) the US economy (the world’s largest economy) – i.e. it is still expected to grow. And today’s (26 October 2018) US Q3 GDP figures show that while US economic growth slowed from the previous quarter’s 4.2%, annualised growth rate, it still grew by 3.5%. Unfortunately, of the Fed policymakers that have presented recently (including its President, Jay Powell), most have suggested the current policy stance is for at least 3 or 4 US interest rate increases. 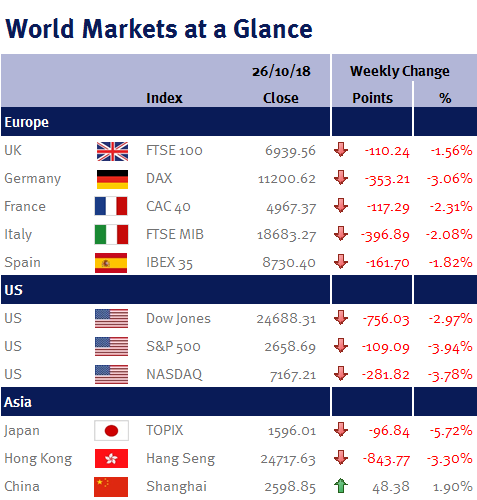 While there are no signs of a recession on the horizon, this week’s fall in global equity markets is telling me that the market is finally waking up to the fact that the US Fed could over tighten. I have been saying ad-nauseam that policy error by the Fed is a risk, as increasing US interest rates too fast and by too much will slow US economic growth and have a negative impact on companies – personally, I believe the Fed would be better being patient in order to nurture and lengthen the on-going jobs recovery, especially given the lack of inflationary pressures. Furthermore, the oil price came close to $75 this week (which represents a fall of over 10% since its peak at the start of the month) after Saudi Arabia pledged to meet any supply shortfalls due to Iranian Sanctions which effect from Sunday 4 November 2018 – and this means inflation expectations should also fall, which in turn further weakens the rationale for the Fed to aggressively increase interest rates. On a positive note, when (not if) the Fed’s conviction in the need for significantly higher interest rates does recede, it will be good news for global equity markets (especially as they are looking cheap) – I just hope that Donald Trump’s recent criticisms of the Fed and its President, doesn’t embolden them to prove its independence. This coming week, Friday’s (2 November 2018) employment data (non-farm payrolls; unemployment rate; the participation rate; and average earnings) is the week’s key US economic event. We also have the Fed’s preferred inflation measure, the PCE, on Monday (29 October 2018). Elsewhere we have eurozone Q3 GDP, unemployment and CPI; and in the UK we have a BoE monetary policy meeting. Additionally, on Sunday (28 October 2018) we have Brazilian presidential elections and elections in the German state of Hesse (which currently looks like it will deliver another blow to Angela Merkel and her Grand Coalition). Then on Monday (29 October 2018) Philip Hammond, the Chancellor of the Exchequer, delivers his Autumn Budget – it is the first Monday budget since 1962 and is due to start at 3.30pm.